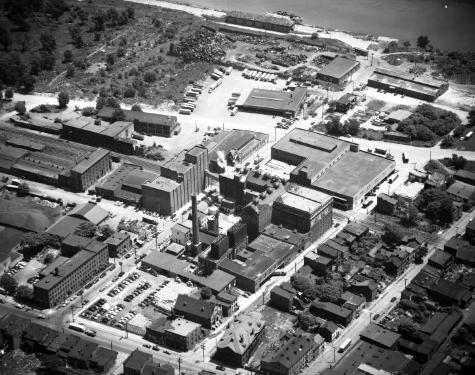 Aerial view of the F. and M. (Frederick and Maximilian) Schaefer Brewery plant formerly the Beverwyck Brewery Company in the vicinity of Broadway in Albany, New York, purchased by Schaefer in 1950. The Albany plant closed in 1972. Several surrounding blocks of homes, businesses, and part of the Hudson River are in view. title originally recorded as "Schaeffer Brewery, N.Y."